Local pride: (From right) Scomi CEO Shah Hakim Zain, Najib and Asmat inspecting a Scomi monorail train at the Matrade convention centre in Kuala Lumpur yesterday. KUALA LUMPUR: Malaysia has unveiled another first – its very own homegrown monorail. The Sutra monorail was developed by the Scomi Group over the last 12 months. Deputy Prime Minister Datuk Seri Najib Tun Razak, who launched the new monorail yesterday, called it a significant milestone. “Today, Scomi has become one of only three major players in the world’s monorail business and has successfully developed a homegrown Malaysian monorail system ready to take on the world,” he said yesterday. Najib said it was a pleasure to note Scomi aggressively pursuing deals in countries like India, Saudi Arabia, Thailand, Vietnam, Bangladesh, Pakistan, Syria, Egypt and South Korea collectively valued at RM6bil. He said regions like Eastern Europe and South America with emerging economies, too, were worth looking into because it was only a matter of time before they needed to consider investing in modern, relatively-inexpensive and practical modes of public transportation. 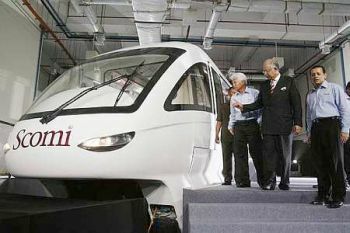 At a press conference later, Najib said that Scomi, being a homegrown company with very high value local content, had an advantage and was in a “very competitive position” to be considered for monorail projects in the country. He said the global world was very competitive and it was essential to position Malaysia and Malaysian companies internationally. “We must build our reputation so that our name is synonymous with reliability, quality, technology and competitive pricing,” he said. Chairman of Scomi Group Bhd Tan Sri Asmat Kamaludin said total investment for the Sutra monorail was about RM35mil including for research, development and factory expansion. He said 30 personnel members including 23 engineers and experts in areas of structural and mechanical engineering, design, quality, safety and procurement worked on it for 12 months at Scomi’s manufacturing facility in Rawang which was equipped with its own 1km of monorail test track.